Timothy and Silas are mentioned in The Acts of the Apostles.Timothy’s father was Greek and his mother a Jewish believer. Paul chose him as a companion for his mission to Asia Minor but had him circumcised because the “Jews who were in those places” knew that his father was a Greek (Acts 16:1–3). Timothy undertook missions to the Thessalonians, Corinthians and the Ephesians. Eusebius counts him as the first bishop of that city. Silas is known by his Latinized name Silvanus when Paul cites him as his companion along with Timothy (1 & 2 Thessalonians 1:1). He was a prophet in the Jerusalem church (Acts 15:22–35), but also a Roman citizen (Acts 16:37–8). He went with Paul and Barnabas to deliver the decision of the apostolic council in Jerusalem (Acts 15:1–21) that Gentile believers did not have to observe the law of Moses. Paul chose Silas to accompany him on missions to Asia Minor and Macedonia where he may have remained after Paul left (Acts 15:41–18:5). Tradition has it that he died there after some years of missionary work. Titus, a Greek, accompanied Paul to Jerusalem for the apostolic council. During Paul’s third missionary journey Titus was sent on missions to Corinth from which he gave Paul encouraging reports (2 Corinthians 7:13–15). 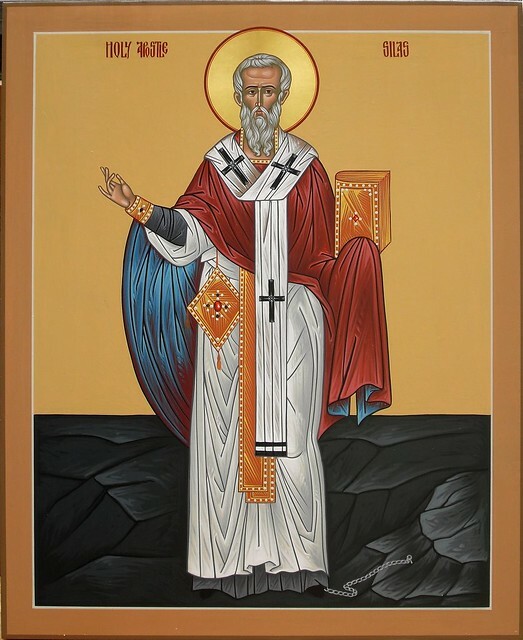 Paul, who calls him: “my true child in the common faith”(Titus 1:14) left him to organize the church in Crete (Titus 1:5) and Eusebius reports that he was the first bishop there. These three are celebrated on the day after the Feast of the Conversion of St. Paul because of their close connections with him. Though they were all young and inexperienced, they were entrusted with missions and matters that helped form the very life and history of the Church. Faithfulness, love and devotion to Christ saw them through situations they could not have imagined. i Just and merciful God, who in every generation hast raised up prophets, teachers and witnesses to summon the world to honor and praise thy holy Name: We give thanks for the calling of Timothy, Titus and Silas, whose gifts built up thy Church in the power of the Holy Spirit. Grant that we, too, may be living stones built upon the foundation of Jesus Christ our Savior; who with thee and the Holy Spirit liveth and reigneth, one God now and for ever. Amen. ii Just and merciful God, in every generation you raise up prophets, teachers and witnesses to summon the world to honor and praise your holy Name: We thank you for sending Timothy, Titus and Silas, whose gifts built up your Church by the power of the Holy Spirit. Grant that we too may be living stones built upon the foundation of Jesus Christ our Savior; who with you and the Holy Spirit lives and reigns, one God, now and for ever. Amen. Collect. IMO, this new collect does not pray as well as the former collect in Lesser Feasts and Fasts 06. It was rewritten because Silas has been added to the day? Why not just add Silas’ name to the former collect? Almighty God, you called Timothy and Titus to be evangelists and teachers, and made them strong to endure hardships. Strengthen us to stand fast in adversity, and to live godly and righteous lives in this present time, that with some confidence we may look for our blessed hope, the glorious appearing of our great God and Savior Jesus Christ; who lives and reigns with you and the Holy Spirit, one God, now and forever. Amen. Readings. There is no mention of Titus, though Paul, Barnabas, Timothy and Silas are. Seems odd for a commemoration of these three men but perhaps there is no scripture that include all of them.. Follow-up on my previous reply — My “ancient” LFF scroll (c. 1980) has the questioned word in the collect as “sure” (sure confidence), so “some confidence” is best understood as a finger twitch on the keyboard rather than eschatological angst. Similarly, “hardships” is in the singular. Thank you for alerting us to the collect revision, Michael. The commemoration should indicate that Silas is being added for Trial Use to the day’s name. The title should be noted as: Timotny, Titus, [and Silas] as it is in the printed edition, page 191. I have mixed feelings reading my way through this commemoration. (1) The detail is a bit more taxing than in more typical commemorations, especially regarding the number of biblical citations in the bio (I count ten). From a LISTENING point of view, rather than a documenting point of view, that doesn’t make for “easy listening.” (2) The Pastorals and the Acts of the Apostles (including the crucial “Jerusalem Council” so prominent in the second reading), are given as authorities for the biographical facts more than the “authentic letters” of St Paul — seemingly without regard to critical concerns. I realize this is not the place for “Intro to NT 101,” but it is of concern. Even Wikipedia knows “Lex orandi, lex credendi is a fundamental character of Anglicanism.” By being less conscientious about this type of thing we may be “orandi-ing” the wrong “credendi”, — to torment a phrase. (3) I also wonder about the sense of boundaries regarding how many, and which, “supporting cast members” from the story of the early church should (or need to) be included in the calendar: they are numerous! And, fully recognizing Paul’s prevalence in the NT (and the dearth of written material from others), I wonder if specifically being HIS companion is in itself a badge of elevation beyond those who also could be named from the NT, or the many other ministers (in any way) whose names we don’t know. Timothy and Titus, at least, are names carried by epistles; “Silas” breaks new ground, invites new commemorations and implies the need for other additions. Despite my posting last time about Anglicans not predicating “saint” of those commemorated, there is the exception for Biblical personages (viz., Saint Paul, 12 apostles, 4 evangelists, Mary and Joseph, Mary Magdalene, Stephen, James the Lord’s brother, and even Michael the archangel). I would think “SAINTS Timothy, Titus, and Silas” might fall well within the scope of this exceptional usage, assuming their continued presence and/or adaptation. TIMOTHY: That Paul “had him circumcised” sounds a bit like a dog I once had neutered. Did Timothy get to vote in that election? “Timothy undertook missions to the Thessalonians, Corinthians and the Ephesians. Eusebius counts him as the first bishop of that city.” That would be the famous city of Thessalonica-Corinth-Ephesus? (“but also a Roman citizen”) Why, “but also”? Why not just “and”? THE COLLECT: The new collect is not without devotional elegance, but eliminating evangelists in favor of prophets and witnesses is disappointing. Granted that Timothy and Silas were prophets, evangelism is still not a four letter word, and summoning “the world to honor and praise God’s holy name” is not quite evangelism, although it overlaps. In no way is it the way of the cross, so much better expressed in the old collect’s “strengthen us to stand fast in adversity, and to live godly and righteous lives in this present time.” There was also an element of pastoring in the biography, speculative though it was (two bishops and a resident presence unto death) that is not reflected in either collect (old or new). Formally and finally, the new collect has nothing overtly or functionally in the way of a “so that” clause, thereby giving God a list of things to do while leaving us free from aspiration, obligation or transformation in any way. I like Michael’s recommendation – just add “Silas” to the first line of the old collect. THE LESSONS: The Isaiah and Psalm choices are okay – “light to the nations” is appropriate to evangelists (or prophets, teachers and witnesses, as the case may be). The gospel selection emphasizes Jesus and his rightness as the one in whom to trust. The Acts reading presents a less than ideal situation by virtue of its length, choppiness, and purview. Evidently, its intent is to provide “the story” behind the commemoration – or at least a representative piece of it. I just don’t think it works. Besides presenting Acts as simple historic narrative, it doesn’t add much we haven’t just heard in the bio. I’d suggest re-thinking what to use, and looking for something not necessarily “biography” oriented, but far more kerygma or mission-oriented, or even the passage behind the “living stones” allusion, 1 Peter 2:1-10. I will note, also, my ancient LFF lists for the epistle an option of either 2 Timothy 1:1-8 or Titus 1:1-5. I also express puzzlement as to why, when LFF followed the BCP practice of listing a full Psalm selection for use with Daily Office, and a shorter Psalm selection for use in Eucharist as a response (presumably, a response after the epistle, although now it would make sense as a response to the OT lesson), in contrast, HWHM has chosen to give only a single Psalm citation, evidently meant for use with Eucharist (judging form the Proper Preface and expanded lessons) and abandoning the Daily Office as a possibility for noting the day’s commemoration. Ultimately, I don’t think we need to add Silas to a perfectly adequate commemoration. Re: Psalm selections BCP vs. LFF. In this Lectionary, the selections from the Psalter are frequently cited in a longer and shorter version, usually from the same Psalm. The longer version is particularly appropriate for use at the Office, the shorter version when the Psalm is sung between the Lessons at the Eucharist. The selections may be further lengthened or shortened at discretion. The Notes ‘Concerning the Proper’, page 89 in the printed edition, do you mention this. Because the Psalm assigned to a given Proper can sometimes occur at Morning or Evening Pryaer on the same day, alternative Psalmody is always provided. In every instance, the alternative Psalmody is drawn from a small corpus of selected Psams, which makes possible the use of a limited yet practically repertry in places where weekday services are sung. This rubric is not included in the HWHM printed edition. I don’t usually comment on the Propers, but I note that the “serial comma”, appropriately used in the title, has been omitted in the Collects. For consistency, it should be inserted in both Collects. Line 7, first paragraph: substitute “Ephesus” for “that city”. It is grammatically incorrect to infer a city’s name when none is mentioned.